Turn on the broiler, and place the tomatillos, jalapeno peppers and Serrano peppers on a baking sheet and broil for 3-4 minutes per side. Please watch them carefully so they don’t burn. Place in a food processor or blender. Add garlic, cilantro, canned green chiles, green onions and lime juice to the blender and blend until fully mixed together. Pour the mixture into a saucepan over medium heat. Add in the vegetable broth and stir well. Stir frequently until heated through. Lower the heat to low and add in the American cheese slices and stir until it is completely melted in and mixed all together well. Salt and pepper to taste. Stir occasionally while you cook the rest of the dish. In a medium skillet, brown the hamburger with the onion and spices until fully cooked. 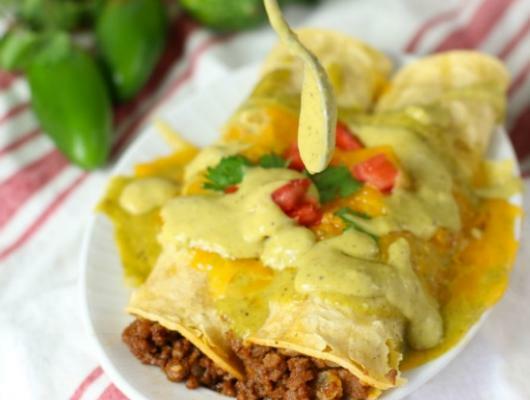 To assemble enchiladas, take the corn tortillas and place on a plate with wet paper towels covering them. Microwave for 45 seconds (this will make the tortilla pliable so it doesn’t crack). In a baking pan, fill each of the 10 corn tortillas with equal portions (several tablespoons) of hamburger, and roll them up. Top with shredded cheese. Heat in the oven for 20-25 minutes until the cheese is melted. Top with the Boom Boom sauce and serve immediately. Bored of the same ole’ Mexican food. 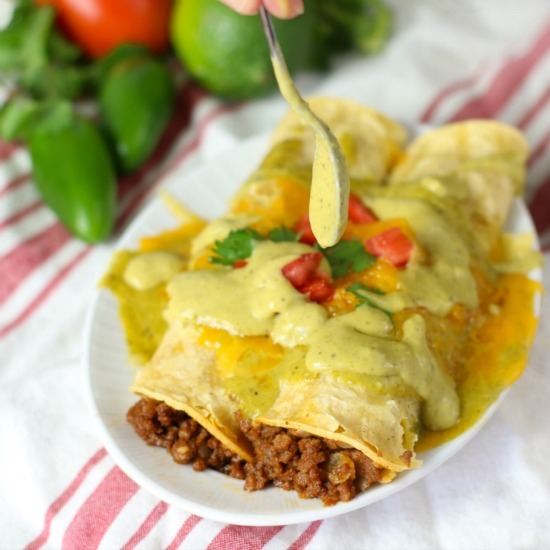 Enter Boom Boom Beef Enchiladas to the rescue! Turn your next dinner party into a Fiesta!